Beef Tenderloin is taken from the full loin of beef and must be stripped out of the loin before it is split into short loin and sirloin in order to have the tenderloin in one piece. This cut is best suited to dry heat cooking methods such as grilling, roasting and broiling. One of the most tender cuts, though not as flavorful as some others. Beef Tenderloin is usually cooked as a big slab, but once cooked the slab is usually sectioned off for servings. 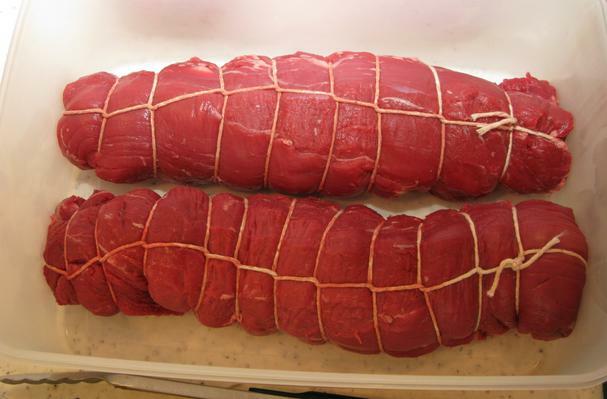 Choosing: A good beef tenderloin will be large and have a squeezable texture. It is hard to tell with frozen tenderloin. Buying: If you want quality beef tenderloin you need to pay for it. Beef tenderloin can be an expensive cut depending on the quality of the meat. Procuring: Free pasture cows will produce the best meats. You will want to find a suitable mixture of spices and to lather your Tenderloin in like peppercorn. Cleaning: RInsing and thawing your tenderloin is key. It can be refrigerated or frozen. It is perishable. History: Beef tenderloin has been consumed as long as man has raised cattle.